Is Ms. Basketball 2014 a foregone conclusion? Tia Elbert led all Minnesota girls with 36 points per game a year ago. The photo at the top of this piece shows Carlie Wagner guarding Ms. Basketball 2013 Rebekah Dahlman. Many would cheerfully hand Wagner the Ms. Basketball 2014 award right now, today. And you've got to admit, Wagner has been nothing short of sensational. Nobody has ever scored 241 points in six state tournament games before, on the biggest stage that Minnesota basketball has to offer. Nobody outplayed Dahlman twice in two tries like Wagner did. But, does that mean she's wrapped up the state's biggest award already? Maybe. I mean, who knows exactly what the voters are thinking. Mostly, do they think Ms. Basketball is a career award or an award for the best senior year? Do they see it like the Heisman Trophy, say, meaning an award for the best regular season? Or does the state tournament count for something? In short, are they willing to hold off and see who has the best year in 2013-2014 before committing to a winner? Nobody knows. But even so, we can safely identify the top 5, 6 or 7 candidates, can't we? Chase Coley (above) and Kenisha Bell are probably the state's top defenders. 1. Carlie Wagner, New Richland-Hartland-Ellendale-Geneva, 5-10, SG. Some people said she was the best of the 2014s even before her first state tournament. But, now, 241 points in six state tournament games pretty much sets her apart from anybody who has ever played the game in Minnesota. It will be very tough to deny her this award. But let's just say she has a little bit of a letdown as a senior. Who could sneak in? 2. 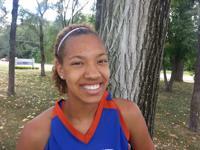 Cayla McMorris, Park Center, 5-11, PF. She's our #2 but more than that, she's explosive and can probably put together the best highlight reel of any of the 2014s. Some people question her size, and her ability to attack the rim, her strongest suit, at the next level. But Ms. Basketball is all about THIS level. If Park Center comes to the state tournament this year, people will be talking about Cayla McMorris. 3. Tia Elbert, Tartan, 5-8, CG. She's our #3 and so she's #3 here. But, again, there's more. She led the state in scoring last year. If Tartan should get to the state tournament, she's the one girl who could score with Carlie Wagner and really get tongues wagging. 4. Chase Coley, Mpls. Washburn, 6-3, C-PF. OK, she's only our #7 but if anybody can put up a highlight reel like McMorris's, it's Chase Coley. Only Coley's would be full of video where she explodes out of the paint to block a jump shot out at the 3-point line. Can't be done? Coley does it, routinely. Never seen anything like it. The greatest shot-blocker in Minnesota history, even including Savannah Trapp. 5. Kenisha Bell, Bloomington Kennedy, 5-7, PG. She's our #6 but, again, if it's highlight reel you want, Bell's your girl. Again, her reel would be mostly D, where she strips the ball in the backcourt, leaving even elite girls in the dust as she cruises downcourt for the breakaway layup. Taylor Thunstedt of New London-Spicer is the only 2014 who can challenge Tia Elbert in the scoring race. Who else could make a run at Ms. Basketball? Maybe Taylor Thunstedt, New London-Spicer, 5-8, CG. Only Tia Elbert is a more explosive scorer. How many more 40 or 50 point games will it take to get Thunstedt on people's minds? Not many. Or Ellie Thompson, Chaska, 6-2, PF. Chaska is looking like a buzz-saw in Fall League. If they stay hot, get to the state tournament and do some damage there, people will surely talk about their best player, and that's Thompson. Or Kylie Brown, Simley, 6-1, F or Tonoia Wade, Bloomington Kennedy, 6-2, SF. They're only our #12 and #13, respectively, but, seriously, we know people who have them top 5, and we're not here to say they're wrong. It could happen. But probably not, because Ms. Basketball 2014 is Carlie Wagner's to lose and barring injury, well, that just seems unlikely. But they're going to play ball again this year and all those games will matter. So, ladies, start your engines!